San Remo is a family run business specialising in Park Cafés, Ice Cream and Event Catering. We pride ourselves on the friendly and efficient service we provide to our customers who are at the heart of everything we do. We operate our Park Cafés in beautiful locations in and around London. With more than ten years experience, we know how to create a warm and welcoming atmosphere. Black Park has to be one of the most idyllic work locations you could imagine. 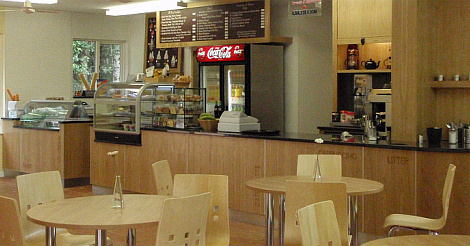 Our newly refurbished and refitted Café is adjacent to a lake surrounded by woodland. The Kiosk is close to the nearby Go Ape Experience at the park. There is no traffic noise or fumes and on fine days you will often be treated to spectacular views across the water. The park can easily be reached by road and is a magnet for both local residents and those from further afield. We believe in providing every customer with a great experience by offering fantastic service each and every time. As the face of San Remo, our friendly and helpful team of staff are a vital part of making that happen. We're looking for enthusiastic, bright, bubbly people to join our Team as front-of-house Customer Assistants at our Lakeside Café at Black Park. We have 2 full-time positions and one lunch cover part-time position available. Your primary role would be on the serving counter to serve refreshments and take food orders, but you would also be expected to help out in other areas of the café when needed. You should be presentable, courteous and confident in dealing with the public. Previous experience working in a café environment is desirable, but full training will be given as well as working towards the CIEH Level 2 Award in Food Safety. A uniform top with logo is also provided. Full time positions are Monday to Friday with occasional weekends during busy periods. Part-time positions are working mainly at weekends, public and school holidays and other busy periods. No evening shifts. Lunch and refreshment during the working day are provided free. Rates are dependent on experience and suitability. We operate a discretionary bonus sharing scheme. We're on the lookout for versatile full and part-time kitchen support staff to work with the team in our Lakeside Café at Black Park. Your duties would include clearing tables in the café to ensure that they are clean and ready for the next customer, washing up and keeping the kitchen area clean and tidy at all times. You should be presentable and courteous dealing with the public. Previous experience working in a café environment is preferred, but not essential. A uniform top with logo is provided. Full time positions are Monday to Friday with occasional weekends during busy periods. Part-time positions are working mainly at weekends, public and school holidays and other busy periods. Lunch and refreshment during the working day are provided free. Rates dependent on experience and suitability. We are looking for enthusiastic hardworking full-time kitchen support staff to work with the team in our busy Lakeside Café at Black Park, offering a full menu to our customers. Your duties would include assisting our chef with daily duties and cleaning and support work. You should be presentable and courteous dealing with the public. Previous experience working in a café environment is preferred, but not essential. We are a team and looking for team players. Please send an email or call the cafe to arrange a trial shift. You will be interviewed after the shift and to discuss your options. Are you a cook with experience working in a busy café kitchen? You could be just the person we're looking for. You would be working in our recently refitted kitchen in our Lakeside Café at Black Park, preparing and cooking snacks and dishes from our standard menu as well as cooking daily specials. Previous experience working in a café environment is preferred together with current Level 2 food hygiene certification (training is available). You will need to be organised and be able to work under pressure. A uniform top with logo is provided. This is a full time position with immediate start. Rates are dependent on experience. Hours are a 5 day week, Monday to Sunday on a rota basis. Lunch and refreshment during the working day are provided free. Part-time positions are working mainly at weekends, public and school holidays and other busy periods. To support our busy park café, ice cream and outdoor event business, we require an enthusiastic and versatile Administration Assistant to work in our head office at Black Park. We are looking for someone with a bright and friendly personality who is able to multi-task according to the needs of the business. You should be able to work on your own initiative and tackle small projects. Your role would include dealing with suppliers, general office administration and enquiries. You should be PC literate and proficient at intermediate level using Microsoft Windows and Office, including Outlook, Word and Excel. You should also be presentable and courteous with good communication skills, both written and verbal. This is a full-time permanent position, Monday to Friday with paid annual leave. Lunch and refreshment during the working day are provided free. Rates are dependent on experience and suitability. We are looking for enthusiastic and flexible people to work in our outdoor events team this year. We attend both local events such as Hayes Carnival and large festivals such as Reading, Glastonbury and the Let's Rock series in Bristol, Southampton and other locations. You need to be presentable, polite and have a good customer service manner. We will endeavour to give you at least one week's notice of each event when you would be required. It is important for the team that you are reliable and if you accept an assignment, you do attend. Opportunities that arise for additional staff during busy periods such as public and school holidays will be posted here, so please check back regularly if you are interested. Please specify the vacancy you are enquiring about. It would also be helpful to provide details of any relevant experience you may have. Please note that you must have the right to live and work in the UK and that references may be requested and taken up.